You are here: Home / Benodigdheden / LocoMix’ favours now available in the UK! LocoMix’ favours now available in the UK! Since 2003 LocoMix produces wedding invitations & favours, birth announcement cards and other invitations in the Netherlands. We are growing every day and we are very happy to announce that we have launched a new website: http://www.locoMix.eu/. This means that our products are from now on also available in the United Kingdom! At LocoMix we believe that a special moment requires a special invitation. That is the reason that we don’t have any simple products in our catalog. All our product have the focus on the message and will definitely surprise the receiver or guest. If you visit our website, we can ensure you a catalog of new, hip, romantic, sweet and attractive designs. Besides that, all products of LocoMix can be customised with your own written message and images. Also, you can choose to make your own design by using our new design tool. The whole production process happens at the same location, therefore LocoMix guarantees you good quality and a fast delivery. So don’t search any further, we can help you making your happy moments even more special! 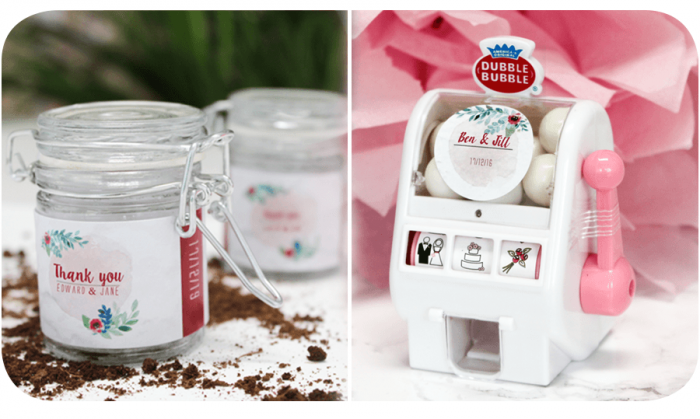 The Green Weck Jars are made of glass and filled with flower seeds and a coco tablet which holds all the necessary nutrients to let the flower grow well. We have several types of flowers to choose from. There are different designs for the wrapper on the jar which you can customise. You can also choose to create your own wrapper in our online design tool. The Green Weck Jars are made of glass and filled with flower seeds and a coco tablet which holds all the necessary nutrients to let the flower grow well. We have four types of flowers to choose from. There are different designs for the wrapper on the jar which you can customize. You can also choose to create your own wrapper in our online design tool. To make your wedding complete, LocoMix recommends you to take a look at our wedding decorations and supplies. For example, choose to capture all special moments with one of our Disposable Wedding Cameras. Other decorations and supplies we have in our catalog are the 3-tier Wedding Favour Stand and the Wedding Sparklers Favours. The Baby Shower Flowerbags are perfect for any garden themed shower. The bags carry a combination of coloured paper confetti with wildflower seeds. These favours are definitely very cute and can also be personalised. The Flower Bag Baby Favours can be ordered from 20 pieces. The Baby Shower Flowerbags are perfect for any garden themed shower. The bags carry a combination of coloured paper confetti with wildflower seeds. 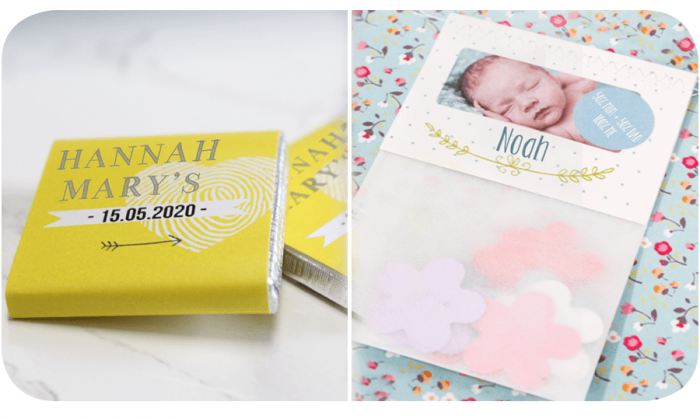 These favours are definitely very cute and can also be personalized. The Flower Bag Baby Favours can be ordered from 20 pieces. Maybe you want an unique favour, invitation or announcement created by yourself. LocoMix makes that possible! We have created a design tool to help you create unique products fitting in with your wishes. Create your own personalised favour, invitation or announcement by adding your own images and texts in our tool. To make it easy for you, you can add images not only from your Local System, but also from Facebook, Instagram, Flickr and Picasa. You can choose your favorite font, such as popular fonts, handwriting fonts and common fonts. These are available in different colours and sizes. To give the product the finishing touch, you can add a background colour or use our clipart database. You can find five menus in this tool to help you true the process of creating your own design. The complete explanation of the tool can be found on our design tool instructions page. Go to our website and try it yourself! Enjoy the fun of trying our new design tool and the discovery of our products and designs in the catalog. If you have any questions, please contact one of our employees. They are very pleased to help you with the perfect invitation, favour or announcements for your baby shower or wedding!